Our number one recommendation for a most memorable dinner while visiting Chilliwack! BRAVO Restaurant and Lounge! Be sure to check out BRAVO’s website, and book your reservation while you’re in town. www.bravorestaurant.ca Don’t miss it! 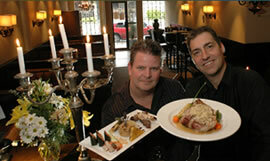 Ask Holly & Ken for many more recommendations of great restaurants in our area. Life begins in the outdoors - and so be sure to start at Mount Waddington Outdoors! This amazing little shop so close to our new studio is a fun experience in itself. At Waddington's, they aim to "inspire people to live for adventure, connecting you to the mountains and building a passion for the world that surrounds us. Mt. Waddington's Outdoors is dedicated to growing the local hiking and climbing scene and providing the expertise and equipment for you to go play in the mountains." Discover the Great Blue Heron Nature Reserve, a 130-hectare (325 acre) site located on the un-dyked floodplain of the Vedder River. Managed by the Great Blue Heron Nature Reserve Society, the site is home to over 90 Great Blue Heron nests and a wide variety of wildlife and vegetation including Painted Turtles, Bald Eagles, and the Salish Sucker. Just a short bicycle ride away, you'll find the walking or bike riding trails of the Vedder Canal Dyke - and the "Rotary Trail". There are numerous other trails for hikers of all levels of fitness closeby, such as Teapot Hill, Elk-Thurston, Lindemann Lake and Mt. Thom to name a few. In the heart of Greendale, youâ€™ll find the Chilliwack Golf and Country Club as well as the Royalwood Golf & RV Resort. and for variety, we are just two minutes away from the . Some of the best golf courses in the Lower Mainland are found in the Chilliwack area. There is something for everyone, from expert courses like The Falls, to scenic courses like Aquadel at nearby Cultus Lake, to Meadowlands , Cultus Lake Golf Club, and Tap-Ins, a putting course at Cultus Lake. Check out our World Class Kart Sprint Track in Chilliwack at www.gokarts.org. Kevin Stone -- Metal Sculptor -- you must visit this website to see the amazing work of this internationally renowned sculptor - made right here in Chilliwack!